Combustible; fire releases spicy smoke. Simvastatin is a synthetic derivative of a fermentation product of Aspergillus terreus. A competitive inhibitor of HMG-CoA reductase. A synthetic analog of Lovastatin. Antilipemic. Simvastatin, the dr ug, is sold under the trade name Zocor. A HMGCR inhibitor and anti-proliferative agent. HMG-CoA reductase inhibitor; decreases levels of low density lipoprotein. Has multiple biological effects including bone formation stimulation, inhibition of smooth muscle cell proliferation and migration, and anticancer and anti-inflammatory activity. 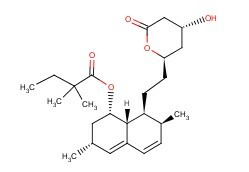 ChEBI: A carbobicyclic compound that is lovastatin in which the 2-methylbutyrate ester moiety has been replaced by a 2,2-dimethylbutyrate ester group. It is used as a cholesterol-lowering and anti-cardiovascular disease drug. Simvastatin is a cholesterol-lowering drug of statin, is a synthetic derivative of Aspergillus terreus fermentation product, is used to control blood cholesterol levels and prevent cardiovascular disease. Simvastatin belongs to methyl hydroxyl coenzyme A (HMG-COA) reductase inhibitors, inhibits synthesis of endogenous cholesterol, and is the lipid regulator. Has a role in reducing cholesterol (TC) content of serum, liver and aorta in hyperlipidemia rabbits reducing levels of very low density lipoprotein cholesterol (VLDL-C) and low-density lipoprotein cholesterol (LDL-C). 1. HMG-CoA reductase inhibitors, can reduce the concentration of serum total cholesterol level, inhibit synthesis of cholesterol. For treatment of primary hypercholesterolemia with cholesterol levels greater than 7.8mmol/L which is invalid or not tolerated in other treatments. 2. Has role in reducing cholesterol, low-density lipoprotein cholesterol and very low density lipoprotein cholesterol. Lovastatin (I, 50.30 g, 0.124 mol) and n-butylamine (42 ml, 0.42 mo1), at 25 ℃: mixed, then heated at 80 ℃ for 1h. Cooled at 25 ℃, evaporated excess butylamine under reduced pressure to give 59.4g compound (Ⅱ), yield was 100%, wass used directly for the next step. Crude product of above obtained compound (Ⅱ), is dissolved in 132 ml of dimethylformamide at 25 ℃, added imidazole (19.59 g, 0.288 mol) and tert-butyldimethylsilyl chloride (TBSCl, 44.4 g, 0.288 mol) , heated at 60 ℃ for 60 h. Cooled to 12 ℃, added anhydrous methanol (5.8 ml, 0.143 mol), stirred at 15 ℃ for 30min, added 1.5 L cyclohexane and 750 ml 5% sodium bicarbonate solution and stirred vigorously. Stratified, cyclohexane layer was separated, washed with 750ml 5% sodium bicarbonate solution and 750ml water. Concentrated to 580ml at atmospheric pressure, then add 600ml of tetrahydrofuran dried by molecular sieve, and then concentrated to 870 ml under atmosphere pressure. 86.9 g compound (Ⅲ) showed in HPLC, yield was 99%, was used directly for the next reaction. Pyrrolidine (25.1ml, 0.301 mol)dried by molecular sieve was mixed with 192 ml of tetrahydrofuran, cooled to-18 ℃, added n-butyl lithium in hexane solution (1.60 mol/L, 181 ml, 0.290 mol), maintained at-10 ℃ about 15min addition was completed, then further reacted at-20 ℃ for 15 min. Thus obtained pyrrolidinyl lithium solution, cooled to-20 ℃ for use. The etrahydrofuran-cyclohexane solution of above obtained compound (Ⅲ) was cooled to-35 ℃, under vigorous stirring, added pyrrolidinyl lithium solution cooled to-20 ℃, maintained at-30 ℃. Addition was completed, stirred at-35 ~-30 ℃ for 2h, then added iodomethane all at once (12.2 ml, 0.196 mol), due to the exothermic reaction at this time, the temperature will rise to 20 ℃, then cooled to-30 ℃, and stirred at this temperature for 1 h. Rose to-10 ℃, stirred for 20 min. added 550ml of water, stirred vigorously for 10min, the organic layer was separated, washed with 550 ml 10 ℃ of 1 mol/L hydrochloric acid. Concentrated to 20% volume under reduced pressure, which contained the compound (Ⅳ), was used directly for the next reaction. Added 690ml of methanol into the above obtained compound (Ⅳ), added 45.7 ml of water and methanesulfonic acid (1.5 ml, 0.023 mol), stirred at 30 ℃ for 5 h, i.e. formed compound ( V), was used directly for the next step reaction. For a solution of above obtained compound (V) , at 25 ℃ 373 ml 2 mol/L sodium hydroxide solution was added, heated at atmospheric pressure, and subjected to distillation, when the temperature of gas phase reached 72~73 ℃, the liquid temperature reached 78~80 ℃, no longer collected distilled distillate. The remaining solution was stirred at reflux for 2h, then cooled to 40 ℃. Most of the methanol was distilled off under reduced pressure, then add 228ml water to dilute. Cooled to 10 ℃, adjusted with 3 mol L/HCl PH = 6~7. And 990 ml of ethyl acetate was added, continued to adjust PH = 5.0 with 3mol/L hydrochloric acid. After stirred to stratify, the ethyl acetate layer was separated, 225 ml of methanol was added. In 1 h, added 75 ml ammonia-methanol: solution (1:3), and then stirred at 45 ℃ for 15 min. In 2.5 h, slowly cooled to-10 ℃, and at-10 ℃ stirred for 1~2 h. Filtered ammonia salts (Ⅵ) crystals, washed with cold ethyl acetate-methanol (3.5:1), at 35 ℃ dried overnight to give 51.37 g ammonia salts (Ⅵ), a yield was 90.9% (calculated by lovastatin). Recrystallized with acetonitrile to obtain a sample for analysis. The crude product of ammonium salt (Ⅵ) was suspended in 1.03 L toluene, inlet nitrogen, heated at 100 ℃ for 6 h. Cooled to 25 ℃, added 2.5 g Darco KB, stirred at 25 ℃ for 30 min. Filtered and the filtrate was concentrated to grease under reduced pressure, added 140 ml of cyclohexane and concentrated. Then add 600ml of cyclohexane, reflux and completely dissolved. Cooled to 10 ℃, stirred for 1 h. Filtered and collected crystals, washed with 25 0ml of cold cyclohexane, dried at 30~35 ℃ under vacuum to give 44.6 g Simvastatin, yield was 94.2%. Recrystallized with methanol-water to give a sample for analysis. Oral-rat LD50: 4438 mg/kg; Oral-mouse LD50: 3000 mg /kg. Treasury is low temperature, ventilation, dry; in dark. (1) For patients with primary hypercholesterolemia, heterozygous familial hypercholesterolemia or mixed hypercholesterolemia, when diet and other non-drug treatment is not ideal, Simvastatin can be used to reduce the increased total cholesterol, LDL cholesterol, apolipoprotein B and triglycerides. And Simvastatin increases high-density lipoprotein cholesterol, thereby reducing the LDL/HDL and total cholesterol/HDL ratio. (2) For patients with homozygous familial hypercholesterolemia, when diet and non-diet is not ideal, Simvastatin can be used to reduce elevated total cholesterol, LDL cholesterol and apolipoprotein B. (1) reduce the risk of death. (2) reduce risk of coronary heart disease death and nonfatal myocardial infarction. (3) reduce risk of stroke and transient ischemic. (4) reduce risk of myocardial revascularization (coronary artery bypass grafting and percutaneous coronary balloon angioplasty). (5) delay the progression of atherosclerosis in the arteries, including the all-new lesions and the occurrence of full clogging. Simvastatin is semi-synthetic, slightly more hydrophobic, analogue of lovastatin. Like lovastatin, simvastatin is a specific inhibitor of HMG-CoA reductase and is used therapeutically to reduce LDL cholesterol. More recently, the statins have become important biochemical probes in cell biology. Their involvement in many events can be correlated to their primary mode of action, however, the mechanism of action of many other effects is less apparent. White crystalline powder, odorless. Soluble in ethanol, acetone or acetonitrile, difficult soluble in ether, practically insoluble in water. Melting point is 135~138 ℃. Simvastatin is a synthetic derivate of a fermentation product of Aspergillus terreus. A competitive inhibitor of HMG-CoA reductase. A synthetic analog of Lovastatin. Antilipemic. Simvastatin, the drug, is sold under the trade name Zocor.